Is Natural Gas No Better than Coal? 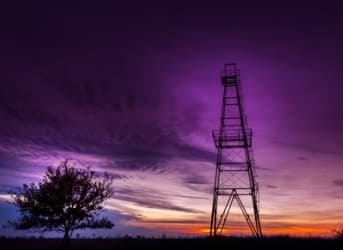 A new study by scientists from Purdue and Cornell suggests that the methane emissions from shale gas could be much higher than previously thought. The study, published in the Proceedings of the National Academy of Sciences, looked at fugitive methane emissions in Pennsylvania by flying an airplane over drilling sites and collecting samples. What they found was a bit unnerving. “It is particularly noteworthy that large emissions were measured for wells in the drilling phase — in some cases 100 to 1,000 times greater than the inventory estimates,” said Purdue chemistry professor Paul Shepson. “This indicates that there are processes occurring — such as emissions from coal seams during the drilling process — that are not captured in the inventory development process.” The study measured 2 to 14 grams of methane per second per square kilometer over active drilling sites during a two day period. During the fracking process, operators at times drill through coal beds in order to get to gas, and methane can escape as a result. The wells leaking the most amount of methane, according to the study’s results, were in the middle of the drilling phase. The results are troubling because natural gas has been trumpeted for its supposed emissions benefits when compared to coal. The latest report from the Intergovernmental Panel on Climate Change notes that hydraulic fracturing has been “an important reason for a reduction in GHG emissions in the United States.” But it then goes on to say that more research is needed to understand the extent to which methane is escaping during the drilling process. The key threshold that scientists agree upon is 3.2% - if less than that amount of methane is being emitted than natural gas maintains its advantage over coal. The problem is that the latest Purdue/Cornell study pegs the fugitive rate at somewhere between 2.3% and 17.3%. Much hinges on the exact rate of methane leakage, but different studies have thus far produced very different results. Clearly, more study is needed, but the evidence at least suggests that there is a possibility that natural gas is no better for the climate than coal. Not that greenhouse gas emissions are at the forefront of politician’s minds, particularly in Pennsylvania where the Purdue/Cornell study was conducted. Even the Democratic candidates in this year’s gubernatorial election in Pennsylvania are falling over each other to tout their plans to bring fracking riches to the state. That makes the federal government’s next steps on methane all the more pivotal. The EPA has rules coming into effect in 2015 that will govern new fracking sites. The so-called “green completion” rules will require operators beginning in January 2015 to capture methane that they have until now been flaring during the flowback phase. These rules are already likely leading to lower emissions as companies begin to comply with the rules ahead of next year’s deadline. The White House is considering further action on methane, which would target other places along the supply chain, and has instructed EPA to study the matter. The Obama administration will decide later this year if it wants to pursue tougher regulation. But the Purdue/Cornell study also suggests that the EPA does not have even the basic data from which to regulate. If methane emissions are escaping at a rate that deviates sharply from what EPA believes, forthcoming rules may not be appropriately calibrated. However, with the White House directing the EPA to study the matter more closely, it is possible that it also comes to the conclusion that methane is leaking into the atmosphere at a higher rate than it previously thought. If that occurs, it would be more likely that the Obama administration decides to take tougher action on methane before the President’s term is up in late 2016. Is this Prof Paul Shepson the only one that has come up with new discovery? Well Folks....I guess we will have to freeze in the dark.